Flavorful, Indulgent tasting and so satisfying! This Vegetarian Pad Thai is a real win! Packed with goodness and fresh tasting, but it has multi levels of flavor and is so satisfying. Plus, it’s super easy to whip up! 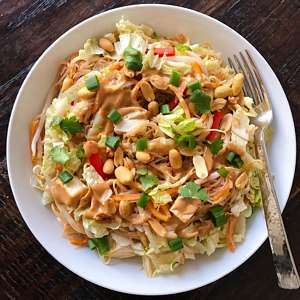 It is a mix of rice and sweet potato noodles, shredded cabbage, bean sprouts, tofu, peanuts and the yummiest peanut sauce! More on the Peanut Sauce… it is seriously so yummy, practically drinkable. Made with natural peanut butter, gluten-free tamari, ginger, rice wine vinegar, lime juice, water, brown sugar and 2 “squirts” siracha sauce, it is the perfect sweet – savory balance. Note: I’ve made this both with and without sweet potato noodles depending on what I have on hand and it’s great both ways. Scroll down for recipe and leave me a comment if you try it. This fresh, easy dish is packed with vegetables and topped with a sweet-savory peanut sauce. It is packed with flavor, tastes indulgent without being heavy and is so satisfying. I've made this dish both with and without sweet potato noodles and it's great both ways. Made for 2 servings. You could easily adjust quantity and add more or less of your favorite veggies and add any other protein. Over medium heat, add oil, tamarind sauce, soy sauce and heat until it is about to simmer. Add scallions and garlic and simmer for a few minutes. Remove from heat and add ginger, lime juice and maple syrup. Mix well. Set aside. Combine prepared noodles, sweet potato noodles, cabbage, and sprouts in a large bowl and add dressing mixing well. Store extra peanut sauce in the refrigerator in a sealed jar and use as salad dressing or dip for the next few days. This looks great! Is the tofu uncooked? Thanks so much! It is one of my favorites! I happen to be a huge tofu fan and it is uncooked in this dish. You could always grill it or roast it if you wanted but it is an extra step. The other day I picked up a package of already grilled tofu which I thought was really interesting and tasted good, that would work too. Let me know if you try it. Do you do the sweet potato noodles yourself with a spiralizer or do you buy them dried? I’ve never seen them before! I usually purchase them pre-sprialized but you could make your own. Let me know if you try! My daughter said it best- “This is totally amazing.” Awesome recipe was a hit with the whole family and the sweet potato noodles were very easy to do with a spiralizer and some sautéing. Yay! Love that your daughter and entire family loved it! Thanks for sharing!